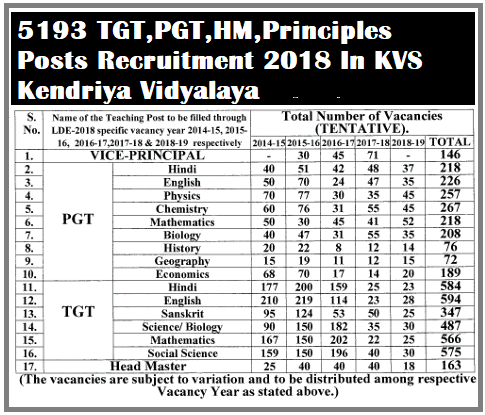 KVS 5193 TGT,PGT,HM,Principles Posts Recruitment 2018 In KVS Kendriya Vidyalaya - Apply Online,Last Date April 25, 2018.KVS Recruitment 2018: Kendriya Vidyalaya opens 5193 posts,Filling up the Posts of Vice-Principal, PGT, TGT and Head master through Limited Departmental Competitive Examination (LDCE) 2018 - NOTIFICATION regarding.5193 PGT TGT HM Posts Recruitment 2018 In Kendriya Vidyalaya -Apply Online @kvsangathan.nic.in. For Vice-Principal: Post Graduation/ Master's Degree with B.Ed. Or equivalent and 05 years Working Experience. For Post Graduate Teacher (PGT): Post Graduation/ Master's Degree with B.Ed. Or equivalent and TGTs having 03 years regular service as TGT in KVS. For Trained Graduate Teacher (TGT): Post Graduation/ Master's Degree with B.Ed. Or equivalent and PRTs having 05 years of regular service. Vice Principal – Must have 5 years of experience in PGT or 10 years regular service as PGT & TGT. PGT – Must have 3 years regular service as TGT. TGT – Must have 5 years of regular service as PRT’s. HM – Must has 5 years of regular service as PRT’s in KVS. However check the notification further details about experience. LDCE Examination (Limited Departmental Competitive Examination). Read the advertisement details very carefully to ensure your eligibility before "Online Application"
Candidates need to fill up to all required information in "First Screen" tab and click on "SUBMIT" to move next screen.